For the Hymenoptera, taxonomic data from one grade (Symphyta) and one Superfamily (Ichneumonoidea), including 15 families and 10,717 species, are included. Ichneumonoidea is the largest superfamily of Hymenoptera and consisting of two extant families, Ichneumonidae and Braconidae. The costal cell of the fore wing is absent, the fore wing has at least two closed cells, the constriction between the mesosoma (thorax + first abdominal segment or propodeum) and the metasoma (remainder of abdomen) is distinct and the parasitoid larvae usually spin a silken cocoon. Also, the metasoma is ventrally partly desclerotized in the vast majority of ichneumonoids. In 1998 the European Commission published the European Community Biodiversity Strategy, providing a framework for development of Community policies and instruments in order to comply with the Convention on Biological Diversity. This Strategy recognises the current incomplete state of knowledge at all levels concerning biodiversity, which is a constraint on the successful implementation of the Convention. Fauna Europaea contributes to this Strategy by supporting one of the main themes: to identify and catalogue the components of European biodiversity into a database to serve as a basic tool for science and conservation policies. With regard to biodiversity in Europe, science and policies depend on sufficient knowledge of its components. The assessment of biodiversity, monitoring changes, sustainable exploitation of biodiversity, as well as much legislative work depends upon a validated taxonomic overview, in which Fauna Europaea plays a major role by providing a web-based information infrastructure with an index of scientific names (including important synonyms) of all living European land and freshwater animals, their geographical distribution at the level of countries and some relevant optional information. In this sense the Fauna Europaea database provides a unique reference for many user-groups such as scientists, governments, industries, conservation communities and educational programs. Fauna Europaea (FaEu) kicked off in 2000 as an EC-FP5 four-year project, delivering its first release in 2004 ( Jong de et al. 2014 ). Fauna Europaea has continuously been updated, and after a further decade of steady progress, to efficiently disseminate the results of Fauna Europaea and to properly credit the Fauna Europaea contributors, modern e-publishing tools are being applied to prepare data papers on all 58 major taxonomic groups. For this purpose a special Biodiversity Data Journal Series has been compiled, called Contributions on Fauna Europaea (see also: Pensoft News item 17 Dec 2014). This work was initiated during the ViBRANT project and is further supported by the recently started EU BON project. In the EU BON project also further steps will be made to implement Fauna Europaea as a basic tool and standard reference for biodiversity research and as a means to facilitate taxonomic expertise evaluation and management in Europe, including its contributions to the European Taxonomic Backbone (PESI / EU-nomen) project ( Jong de et al. 2015 ). This paper is the first publication of the Fauna Europaea Hymenoptera (Symphyta & Ichneumonoidea) data sector as a BDJ data paper in the Fauna Europaea series. 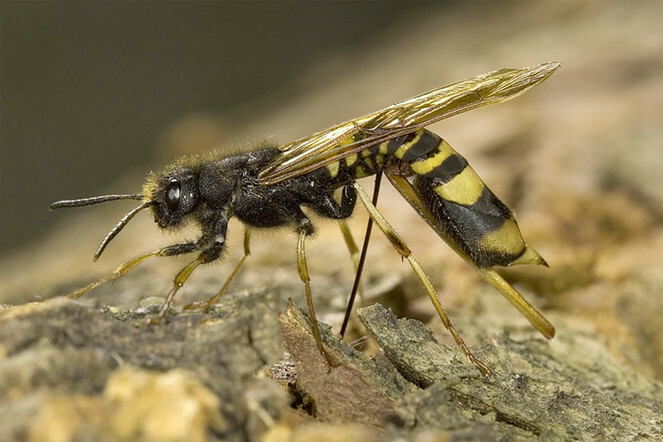 Although practically treated as a grade, Symphyta form a paraphyletic assemblage and are not a monophyletic clade; the name is used for all Hymenoptera with the abdomen broadly connected to the thorax and having wings with several closed cells or with cenchri present. The fore tibia has often two apical spurs and the larvae are usually caterpillar-like (“false caterpillars”, with 6-8 pairs of abdominal legs). Larvae boring in wood or stems are legless grub-like larvae; ovipositor usually very wide and saw-like, but narrow in Siricidae, Xiphydriidae and Orussidae. Fauna Europaea is a database of the scientific names and distributions (at national or in some cases regional level) of all currently known extant multicellular European terrestrial and freshwater animal species. The database has been assembled by a large network of taxonomic specialists. An extended description of the Fauna Europaea project can be found in Jong de et al. 2014 . A summary is given in the sections below. The Hymenoptera (Symphyta & Ichneumonidae) is one of the 58 Fauna Europaea major taxonomic groups, covering 10,717 species ( Fig. 1 ). The data were collated by a network of 7 specialists ( Table 1 , Table 2 ). 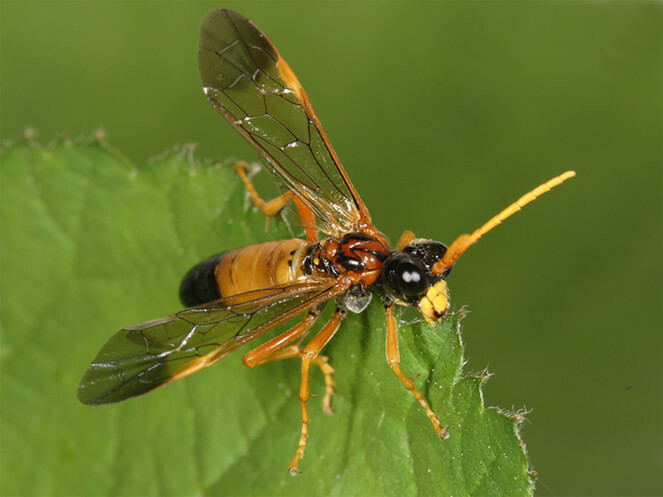 Responsible specialists per family in Hymenoptera — Symphyta + Ichneumonidae. 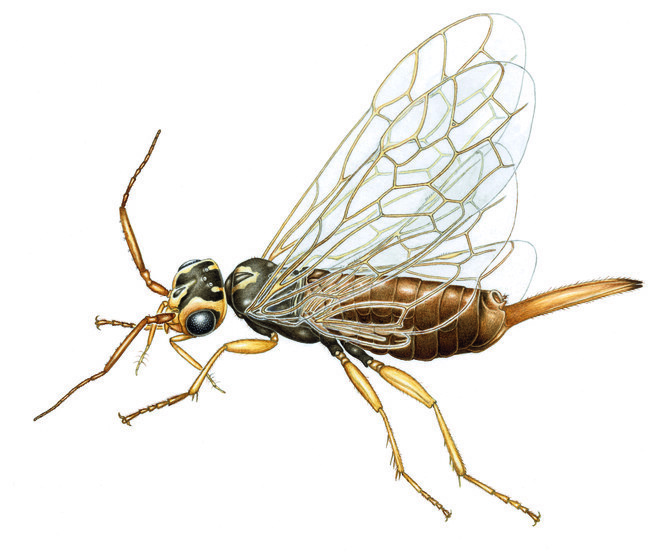 Responsible associated specialists in Hymenoptera — Symphyta + Ichneumonidae. 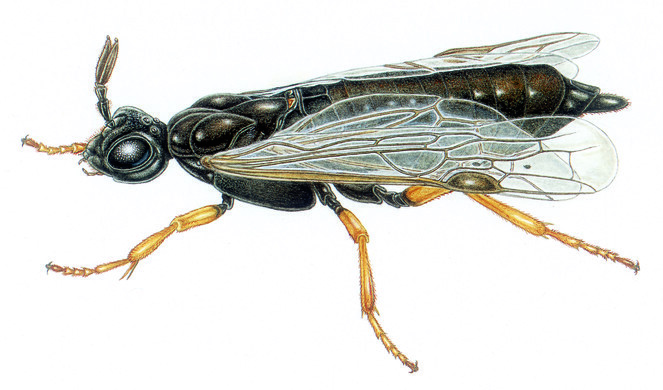 FaEu Hymenoptera (Symphyta & Ichneumonoidea) species per family. See Table 1 for family statistics. Xyelidae: Oldest extant family of Hymenoptera with small number of extant species in the Holarctic region. The imagines visit flowering (birch-)catkins, near the conifers where the larvae eat pollen in the cones of pines (Pinus spp.) and new buds and shoots of firs (Abies spp.). The maxillary palpi are aberrant and used as a grasping instrument ( Fig. 2 ). Xyelidae Xyela julii (Brebisson, 1818). Drawing by Erik-Jan Bosch. Megalodontesidae: Small family formerly known as Megalodontidae and occurring in the subtropical parts of the Palaearctic region. Most larvae live (solitarily) in a case, which is generally suspended among or on the leaves of umbelliferous plants, on which the larvae feed. Pamphiliidae: Medium-sized family occurring in the Holarctic region. The larvae generally live solitarily in spun cases or curled-up leaves of Rosaceae and other deciduous plants or gregariously on coniferous trees ( Fig. 3 ), although some Neurotoma (on Rosaceae) are gregarious. Pamphilius aurantiacus (Giraud, 1857). Photo by C. van Achterberg. Blasticotomidae: A very small family (with only two genera and 12 extant species) and now confined to temperate forests of the Palaearctic region. The larva of the only European species, Blasticotoma filiceti Klug, 1834, lives in the stems of ferns in a small chamber (or gall) and feed on the phloem fluids ( Fig. 4 ). Blasticotoma Klug, 1834. Drawing by Erik-Jan Bosch. Argidae: Medium -sized cosmopolitan family; the larvae of Arginae live especially on Rosaceae, but also catkin-bearing trees (Salicaceae, Fagaceae) and Proteaceae are used. Larvae of some Sterictiphorinae live on herbaceous Fabaceae. The males in the subfamily Sterictiphorinae may have the third antennal segment branched. Tenthredinidae: Large and very diverse cosmopolitan family containing most species of Symphyta in the Holarctic region. The larvae live on or mine on many kinds of trees, shrubs or herbaceous plants, including fruits, ferns, horse-tails (Equisetum spp.) and rushes (Juncus species) ( Fig. 5 , Fig. 6 ). Tenthredinidae Tenthredo campestris Linnaeus, 1758. Photo by H. Berkhoudt. Tenthredinidae (Tenthredininae) Latreille, 1802. Drawing by Bas Blankevoort. Heptamelidae: Small Old World family with only two genera and 36 extant species. The European Heptamelus species use ferns as their larval food: the egg is entirely inserted in the rachis or petiole of the fern and the larva bores in the petiole of fern. Previously treated as a tribe of Tenthredinidae-Selandriinae, but raised to family rank by Malm & Nyman ( Malm and Nyman 2014 ). Larva of Pseudoheptamelus is exophytic. Cimbicidae: Rather small Holarctic family. The often conspicuous larvae live on various deciduous trees, climbers (Lonicera spp.) and herbs ( Fig. 7 ). Cimbicidae Abia fasciata (Linnaeus, 1758). Photo by H. Berkhoudt. Diprionidae: Rather small and mainly Holarctic family. The larvae live (often gregariously) on conifers, and may become a serious pest. Adult males of several species have conspicuously branched antennae. Cephidae: Rather small and mainly Holarctic family. The larvae bore in twigs of deciduous trees and shrubs or in stems of Gramineae (Poaceae). Siricidae: Rather small and mainly Holarctic family, but introduced with timber into other areas. The larvae bore in wood of coniferous and deciduous trees and shrubs, stems of Gramineae (Poaceae), or sometimes in herbs." (e.g. Pachycephus in Papaver). Adults have their wings more or less longitudinally wrinkled ( Fig. 8 ). Siricidae Tremex fuscornis (Fabricius, 1787). Photo by R. Krekels. Xiphydriidae: Rather small family, known from all regions except the Afrotropical region. The eggs are laid into smaller limbs and branches of deciduous trees wherein the larvae make their burrows ( Fig. 9 ). Xiphydriiidae. Drawing by Bas Blankevoort. Orussidae: Small cosmopolitan family; the larvae are idiobiont parasitoids of wood inhabiting larvae: mainly of Buprestidae, but also of Curculionidae, Cerambycidae, Siricidae and (as hyperparasitoid) Ichneumonidae (Rhyssinae). The first instar larva is a solitary pseudohyperparasitoids, but subsequent instars may feed endophagously in the dead host. Only family of Symphyta with upper valve of ovipositor undivided apically Quicke et al. 1994 and has the long fine ovipositor internalised ( Fig. 10 ). Orussidae Latreille, 1797. Drawing by Bas Blankevoort. Braconidae have the second and third tergites of metasoma immovably joined, vein 2m-cu of fore wing nearly always absent and vein 1r-m of hind wing more or less basally of distal end of vein SC+R or absent. Very large family, with about 21,300 valid species described. 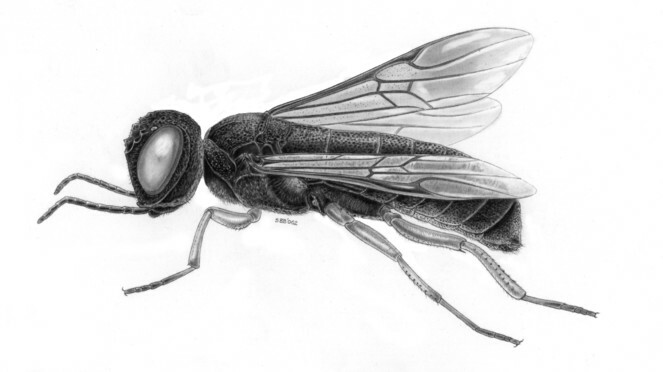 The biology is very variable ( Shaw and Huddleston 1991 ); the legless larvae are ectoparasitoids of all kinds of larvae of insects, egg-larval endoparasitoids, true larval endoparasitoids of several orders of insects (but not as hyperparasitoids; only one genus contains pseudohyperparasitoids) to endoparasitoids of adult beetles, bugs and aphids; exceptionally of adult Apidae and parasitoid wasps. The Aphidiinae are a basal group of the Braconidae and in the past often treated as a separate family Aphidiidae, which is not justified by their phylogeny ( Quicke and van Achterberg 1990 ). Ichneumonidae is the largest family of the Hymenoptera (and one of the largest families of the animal kingdom) with about 25,300 valid species described. Ichneumonidae have the venation of the fore wing rather stable, in contrast to the highly variable venation of Braconidae. The second metasomal tergite is hinged to third tergite (but still movable and not immobilised as in Braconidae), vein 2m-cu of fore wing nearly always present and vein 1r-m of hind wing more or less distally of distal end of vein SC+R or absent. The larvae are parasitoids in or on all kinds of larvae of several orders of insects, but especially of caterpillars and also rather frequent (as pseudohyperparasitoids) of other parasitic Hymenoptera: especially the Cryptinae (the largest subfamily, another part frequently parasitizes egg aggregates of spiders!). The presence of a discosubmarginal cell is also characteristic (but does not exclude all Braconidae). 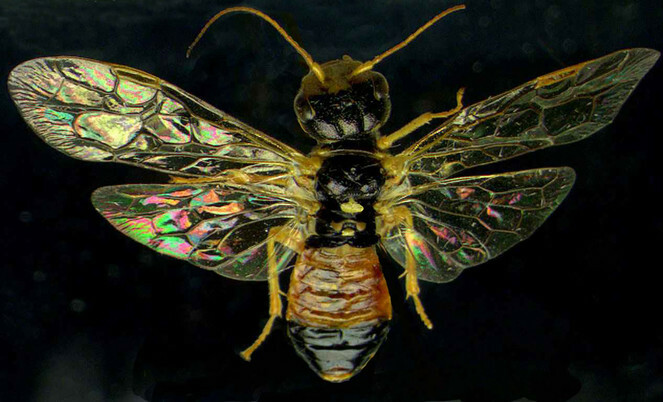 Highly aberrant are the Holarctic Hybrizontinae (formerly included in the Braconidae and often known by its synonym Paxylommatinae) in morphology (e.g. 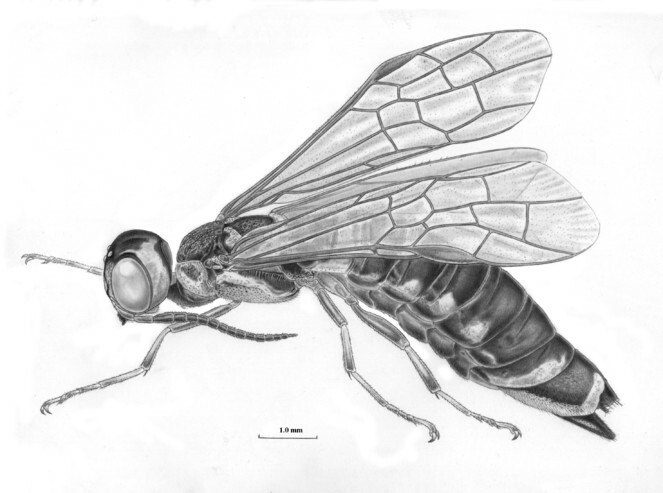 wings) and biology (parasitoids of ant larvae). This BDJ data paper includes the taxonomic indexing efforts in Fauna Europaea on European Hymenoptera (Symphyta & Ichneumonoidea) covering the first two versions of Fauna Europaea worked on between 2000 and 2013 (up to version 2.6). The taxonomic framework of Fauna Europaea includes partner institutes, which together with a number of additional experts, and local scientists provide the taxonomic expertise, taking care of data collation and faunistic quality assurance. Every taxonomic group is covered by at least one Group Coordinator responsible for the supervision and integrated input of taxonomic and occurrence data of a particular group. For Hymenoptera (Symphyta & Ichneumonoidea) the responsible Group Coordinator is Kees van Achterberg. The Fauna Europaea checklist would not have reached its current level of completion without the input from several groups of specialists. The formal responsibility of collating and delivering the data of relevant families has resided with the below appointed Taxonomic Specialists (see Table 1 ), while Associate Specialists deserve credit for their important contributions at various levels, including particular geographic regions or (across) taxonomic groups (see Table 2 ). 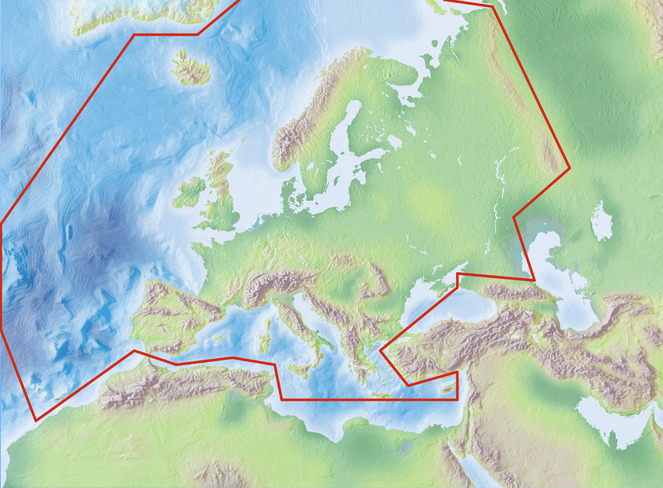 The area study covers the European mainland (Western Palaearctic), including the Macaronesian islands, excluding the Caucasus, Turkey, Arabian Peninsula and Northern Africa ( Fig. 11 ). Standards. Group coordinators and taxonomic specialists have been delivering the (sub)species names according to strict standards. The names provided by FaEu are scientific names. The taxonomic scope includes issues like, (1) the definition of criteria used to identify the accepted species-group taxa, (2) the hierarchy (classification scheme) for the accommodation of the all accepted species and (3), relevant synonyms, and (4) the correct nomenclature. The 'Fauna Europaea Guidelines for Group Coordinators and Taxonomic Specialists' Suppl. material 2 , include the standards, protocols, scope, and limits that provide the instructions for all more than 400 specialists contributing to the project. Data management. The data records could either be entered off-line into a pre-formatted MS-Excel worksheet or directly into the Fauna Europaea transaction database using an on-line browser interface ( Fig. 12 ). The data servers were hosted at the Academic Informatics Center of the University of Amsterdam (SARA/Vancis). Since 2013 the data servers are hosted at the Museum für Naturkunde in Berlin, and a new data entry (update) tool is under development. Data set. The Fauna Europaea basic data set consists of: accepted (sub)species names (including authorship), synonyms (including authorship), taxonomic hierarchy / classification, misapplied names (including misspellings and alternative taxonomic views), homonym annotations, expert details, European distribution (at country level), Global distribution (only for European species), taxonomic reference (optional), occurrence reference (optional). Fauna Europaea was funded by the European Commission under the Fifth Framework Programme and contributed to the Support for Research Infrastructures work programme with Thematic Priority Biodiversity (EVR1-1999-20001) for a period of four years (1 March 2000 – 1 March 2004), including a short 'NAS extension', allowing EU candidate accession countries to participate. Follow-up support was given by the EC-FP5 EuroCAT project (EVR1-CT-2002-20011), by the EC-FP6 ENBI project (EVK2-CT-2002-20020), by the EC-FP6 EDIT project (GCE 018340), by the EC-FP7 PESI project (RI-223806) and by the EC-FP7 ViBRANT project (RI-261532). Continued management and hosting of the Fauna Europaea services was supported by the University of Amsterdam (Zoological Museum Amsterdam) and SARA/Vancis. Recently, the hosting of Fauna Europaea was taken over by the Museum für Naturkunde in Berlin, supported by the EC-FP7 EUBON project (grant agreement ENV-308454). Additional support for preparing the Hymenoptera (Symphyta & Ichneumonoidea) data set was received through the numerous institutions allowing for the proper allocation of time by the contributing taxonomic specialists. Fauna Europaea data have been assembled by principal taxonomic experts, based on their individual expertise, including literature study, collection research, and field observations. In total no less than 476 experts contributed taxonomic and/or faunistic information for Fauna Europaea. The vast majority of the experts are from Europe (including EU non-member states). As a unique feature, Fauna Europaea funds were set aside for paying/compensating for the work of taxonomic specialists and group coordinators (around five Euro per species). 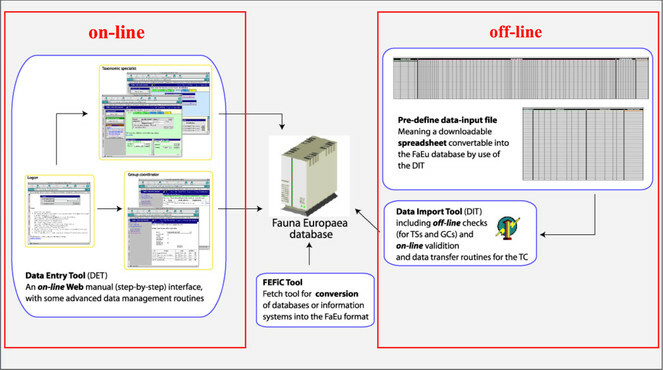 To facilitate data transfer and data import, sophisticated on-line (web interfaces) and off-line (spreadsheets) data-entry routines have been built, well integrated within an underlying central Fauna Europaea transaction database (see Fig. 12 ). This includes advanced batch data import routines and utilities to display and monitor the data processing within the system. In retrospect, it seems that the off-line submission of data was probably the best for bulk import during the project phase, while the on-line tool was preferred to enter modifications in later versions. This system was operational until 2013 when dismantled for replacement to MfN. For accumulating the data a Visual Basic tool was developed by Henk van Achterberg, including an export routine converting the underlying MS Access database into a suitable data import format ( Fig. 13 ). This tool is still used for updating the database and is available for general use in other Fauna Europaea groups as well. 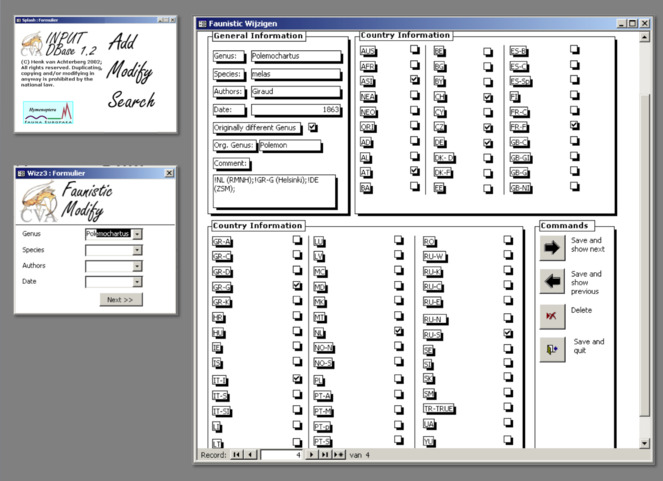 Fauna Europaea - Hymenoptera Visual Basic data import tool, showing interfaces for editing taxonomic and faunistic data. A first release of the Fauna Europaea index via the web-portal has been presented at 27th of September 2004, the most recent release (version 2.6.2) was launched at 29 August 2013. 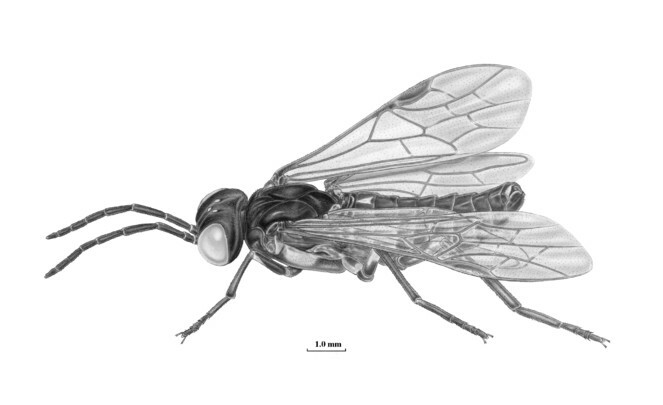 A latest addition to the Hymenoptera (Symphyta & Ichneumonoidea) data was prepared for version 2.1 (December 2009). Fauna Europaea data are unique in a sense that they are fully expert based. Selecting leading experts for all groups included a principal assurance of the systematic reliability and consistency of the Fauna Europaea data. Furthermore, all Fauna Europaea data sets are intensively reviewed at regional and thematic validation meetings, at review sessions on taxonomic symposia (for some groups), by Fauna Europaea Focal Points (during the FaEu-NAS and PESI projects) and by various end-users sending annotations using the web form at the web-portal. Additional validation on gaps and correct spelling was effected at the validation office in Paris. This thorough review procedure makes Fauna Europaea the most scrutinised data set in its domain. In general we expected to get taxonomic data for 99.3% of the known European fauna directly after the initial release of Fauna Europaea ( Jong de et al. 2014 ). The faunistic coverage is not quite as good, but is nevertheless 90-95% of the total fauna. 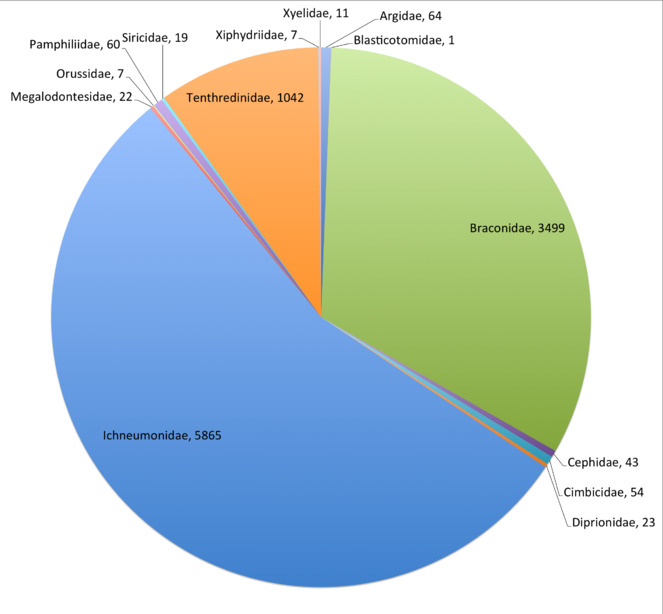 Recognised gaps in Hymenoptera (Symphyta & Ichneumonoidea) are in major subfamilies of the Braconidae (e.g., small Opiinae, Alysiinae, Microgastrinae) and Ichneumonidae (especially Cryptinae and Campopleginae) (see Table 1 ). To optimise the use and implementation of a uniform and correct nomenclature, a cross-referencing of the Fauna Europaea Hymenoptera (Symphyta & Ichneumonoidea) data-set with relevant taxonomic resources is recommended, also supporting the global efforts on establishing a global taxonomic resolution service, provisionally called 'Global Names Architecture' ( Pyle and Michel 2008, Jong de et al. 2014 ). Applicable nomenclature databases specifically dedicated to these taxonomic groups include: the world catalogue on Ichneumonoidea: Taxapad ( Yu et al. 2016 ) and the Electronic World Catalog of Symphyta: ECatSym ( Taeger et al. 2010, Taeger et al. 2011 ). As a preparation, a semi-automatic validation on the Taxapad dataset has been carried out, using the PESI Taxon Match Tool and LifeWatch Backbone services. The result is used to annotate discrepancies between both Taxapad and Fauna Europaea and to mark gaps in the current version of Fauna Europaea, supporting data validation ( Suppl. material 1 ). By evaluating team structure and life cycle procedures (data-entry, validation, updating, etc. ), clear definitions of roles of users and user-groups, according to the taxonomic framework were established, including ownership and read and write privileges, and their changes during the project life-cycle. In addition, guidelines on common data exchange formats and codes have been issued (see also Suppl. material 2 ). Species and subspecies distributions in Fauna Europaea are registered at least a country level, meaning political countries. For this purpose the FaEu geographical system basically follows the TDWG standards. The covered area includes the European mainland (Western Palaearctic), plus the Macaronesian islands (excl. Cape Verde Islands), Cyprus, Franz Josef Land and Novaya Zemlya. Western Kazakhstan and the Caucasus are excluded (see Fig. 11 ). Mediterranean and Arctic Latitude; Atlantic Ocean (Azores) and Ural Longitude. The Fauna Europaea database contains the scientific names of all living European land and freshwater animal species, including numerous infra-groups and synonyms. More details about the conceptual background of Fauna Europaea and standards followed are described in the project description papers. 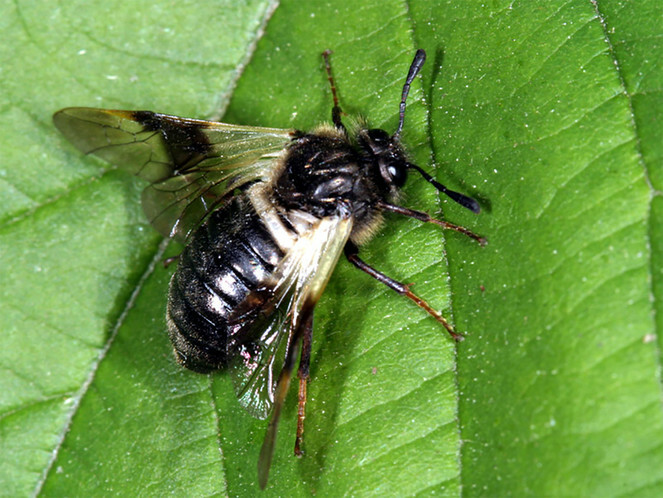 This data paper covers the Hymenoptera (Symphyta & Ichneumonoidea) content of Fauna Europaea, including 14 Families 10,717 species, 39 subspecies and 761 (sub)species synonyms (see Fig. 1 ). Currently living animals in stable populations, largely excluding (1) rare / irregular immigrants, intruder or invader species, (2) accidental or deliberate releases of exotic (pet)species, (3) domesticated animals, (4) foreign species imported and released for bio-control or (5) foreign species largely confined to hothouses. Fauna Europaea data are licensed under CC BY SA version 4.0. The experts keep property rights over their data, initially covered under the FaEu-SMEBD conditions. For more copyrights and citation details see: https://fauna-eu.org. For correct use and citing of the Taxapad data set, please check the relevant website. Henk van Achterberg is thanked for developing the very useful Visual Basic tool for preparing the initial data set. The authors thank the respective artists and photographers for their generous contribution to the paper. Cross-validation of Fauna Europaea (version 2.6.2) and Taxapad (version 2016). Discrepancies are annotated. For details on data ownership and correct citation please check the Fauna Europaea and Taxapad websites.